The funeral of a five-year-old girl who died after she was hit by a car has been held following weeks of delays caused by a wrangle over family visas. Andrea Gada died after the crash in Eastbourne, on 17 December. Her funeral was postponed in the hope her grandparents and aunt from Zimbabwe could attend, but the Home Office refused temporary visas twice. Her relatives were finally granted temporary visas "on compassionate grounds" earlier this month. 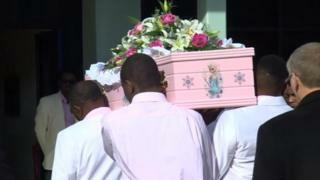 Scores of people attended her funeral at Kings Church in Hampden Park, Eastbourne, earlier. Mourners dressed in pink and white followed the coffin, which was also pink, as it was taken to the church in a horse-drawn hearse. They also sang songs when the pall bearers carried it inside. "The main aim is to have a perfect funeral for Andrea because that's the only final thing that we can do for her," said Charity Gada, Andrea's mother, before the ceremony. The Home Office said it initially rejected the visas because there were concerns Andrea's aunt Mona Lisa Faith and grandparents Grace and Stanley Bwanya might try and stay here permanently. That decision was reversed after Prime Minister David Cameron intervened and new visa applications were submitted with the help of Eastbourne's Liberal Democrat MP Stephen Lloyd. Mr Cameron wrote to the family to say he had asked the home secretary to look into their case, after a 120,000-signature petition supporting their plight was handed in to Downing Street. Following the decision, Andrea's father, Wellington Gada told the BBC: "The pain is just unbearable. "My wish would be if something could be changed when there are circumstances like this one and for no-one to have to go through the same thing."